Readers of a certain age — say, 30 years or more — will remember when major newspapers were big, colorful, information-packed marvels of news gathering. Before the Age of Great Newspapers ended, around the turn of the century, it had been observed by many subscribers that Sunday editions, in particular, with all their special sections and advertising inserts, were often heavier than many breeds of dogs. The eager pooches were overmatched by all those words and photos and ads, and were physically unable to drag the paper from the porch to their masters, waiting indoors. Alas, the internet came along, and smart phones, and newspapers have been shrinking apace, sometimes disappearing altogether. Those great beasts of a generation earlier … seemingly on the verge of extinction. And then I saw a stack of The Times of London, available free to any interested passenger, ahead of a five-plus-hour flight to Egypt. I immediately picked up a copy … and was astonished to feel the heft of it. For a moment I thought I must have picked up two or three copies, it was that heavy. But no. Those 116 pages were all part of the edition of April 6, 2019. A fat, sprawling monster of a newspaper that brought back memories of the industry’s good old days. The Times (“Britain’s most-trusted newspaper”), at least, seems to be hanging on just fine. Did I mention it was 116 pages? OK, yes, it was 116 tabloid pagers, which would translate to 58 pages, if produced in a “broad sheet” fashion as The Times was, before 2004. But 116-pages of tabloid (or “compact”) newspaper … is nothing to sniff at. Most of a pound (in weight) and two pounds sterling (about $3 U.S. to buy) and jammed with interesting content. Riff Raff the rogue elephant, Brexit enough to beat the band, a page 1 expose on the perfidy of “estate agents” (realtors), a “stabbing rampage”, an update on the chaos in Libya … and on and on. The newspaper was augmented by a 20-page pullout sports section, with lots of easy-on-the-eye charts and and other graphic devices. Soccer, rugby, county cricket and a full page previewing The Boat Race — the annual Oxford versus Cambridge eights rowing competition down the Thames River. Then there was a section inside the sports section (sort of like readable nesting dolls), 12 pages given over to previewing the Grand National, the annual cavalry charge of an equine demolition derby with up to 40 horses and jockeys negotiating jumps of various shapes and sizes over a 4.3-mile trip that lasts nine minutes. So, 32 pages in addition to the regular newspaper, which was another 84, and there you had 116 pages of crinkly, all-color newsprint in your hands. The main bits of the newspaper were given over to British news, then world news, business news, money (with a lot of the small type I have never read, pertaining to equity prices and financial futures, etc. ), which led us to staples of the days of yore — a weather page, three pages of obituaries (including one on a minister who specialized in three-minute sermons), a page for wedding and birth reportage, a religion page (!) and, at the inside-back of the “book”, a full page of brain-teasers — two crosswords, a trivia quiz and some odd puzzle. 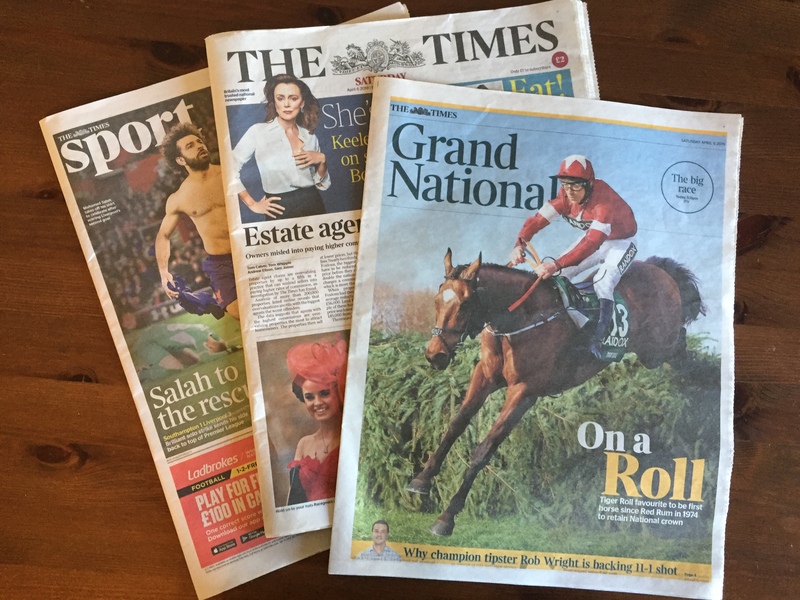 I was so impressed by all this that I have carried that copy of The Times from the boarding area at Gatwick to Egypt, to the Red Sea and up the Nile, and all the way back to France, via England, two weeks later. How was this miracle of a newspaper possible? Well, the cover price is, as noted, about $3 per copy), and the circulation income is augmented by dozens of ads, including a full page on page 116 paid for by Cartier. The Times claims in excess of 400,000 readers of its print product, with 220,000 readers of the online edition, and some way or another the newspaper founded in 1785 keeps trucking along. Is it simply a business dinosaur, one of the last of its species? Or can it be a viable daily product for another decade or three? I certainly hope it is the latter. I would occasionally buy The Times on newsstands in Italy during my trips there and was always impressed. Started reading it online until they put up the hard paywall; can’t quite justify that expense although I wish I could. Glad to know it’s still thriving.